Hume & Hovell’s exploration party were the first Europeans to see and then name Mount Buffalo on November 24, 1824. Not until the discovery of gold 30 years later, did the first Europeans scale the mountain. They were government surveyors who surveyed and mapped the plateau. 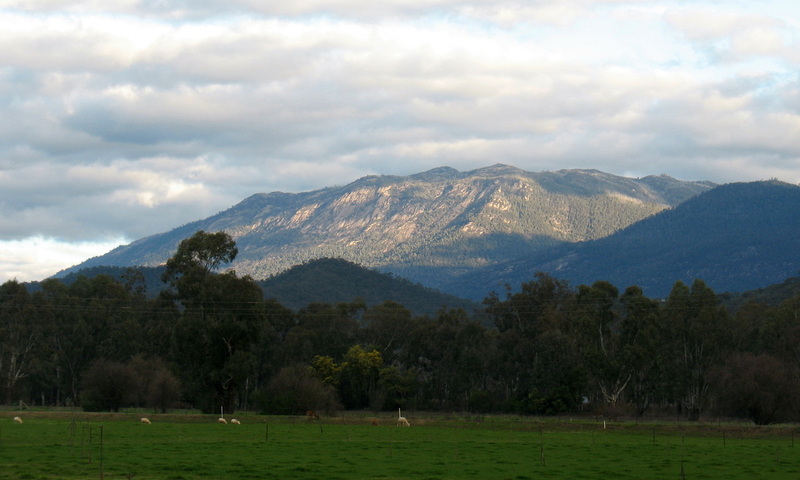 In 1854, James and John Manfield climbed the long spur from the Buckland Valley, exploring the plateau. Later, a group of Buckland miners would walk the length of the plateau from The Horn to The Gorge with a Manfield as guide. Soon, seasonal mustering of cattle driven up the southern slopes of Buffalo would occur, due to its abundance of good feed on the open plains. This photograph shows an aerial shot of the Chalet, perched on the Gorge face. The scenic fame of the mountain gradually spread and visitors arrived by way of the rough and remote Horn end. A Gorge side entry was found and a local Alpine Club promoted the development of a walking track from that end. The present road duplicates much of this track. 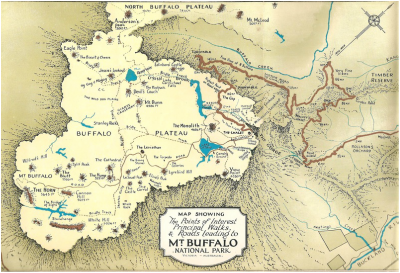 A primitive, temporary dwelling was erected between The Hump and The Horn for visitors, but it was guide Ted Carlile who was to build the Buffalo Hospice not far from The Monolith and keep the track in good condition. The first Chalet was built upon the site of the existing chalet in 1910, two years after the opening of the road, which the Victorian Government built when it took over the mountain as a national park. Subsequently widened to two-lanes by the Country Roads Board, road construction was supervised by Carlo Catani, Engineer-in-Chief, Public Works Dept. He also was in charge of the construction of the lake which bears his name. In 1924, the Victorian Railways assumed control of The Chalet, with coordinated rail and coach services bringing visitors to the mountain from Porepunkah and Bright. Tobogganing at Dingo Dell in the 1950s. Skiing at Cresta for all ages. A line-up for the ski tow in the late 1960s. A horse riding group looks over the Gorge at the end of a trek on the plateau. Horses were stabled at the Chalet and were familiar with all designated walking tracks in the Park. Canoeing on Lake Catani on a summer afternoon in the 1930s. Canoes were available for hire through the Chalet. Clearly visible at the time it was taken in the 1930s, the torpedo was concealed by vegetation over the years. Subsequent bushfire activity has revealed it on several occasions. Visitors conclude a walk through the snow at the base of the Cathedral and Hump in the 1930s. This venue is still a popular spot today for bush walks and rock climbing.